I made a list a few years ago of movies centered around, set during, or containing elements of Halloween. 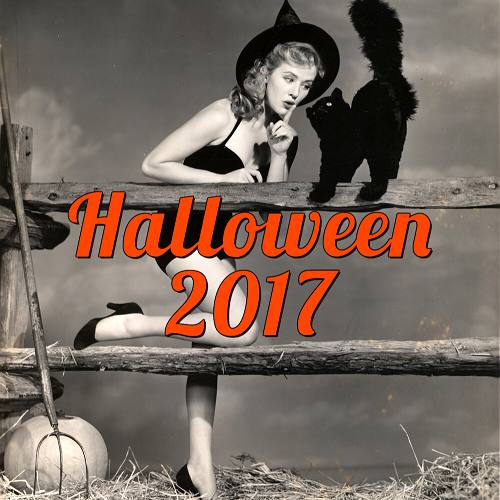 Since then, I've noticed that list becoming sadly out-of-date and incomplete, so I decided to start a new, more comprehensive list of movies that are Halloween-themed. All of the films listed below contain Halloween elements, whether briefly or for their entirety. 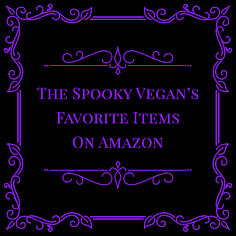 Some are set during Halloween, others just use the autumn season as a backdrop for their stories, some are directly about Halloween, but they will all help evoke that special Halloween spirit! In this new list, I've not only included films I'd missed on the old list as well as new movies, but I've also broken down the movies into categories, from horror movies to family-friendly films to comedies and so on, as well as noting whether I recommend them or not. I've labeled each movie (at least the ones I've seen) with a rating of "recommended," "watch at your own risk," or "skip it." 31 (2016) - Set on Halloween night, but lacking Halloween atmosphere. Plus, it was super-polarizing in theaters - watch at your own risk. Abandoned Mine (2013) - It has some nice Halloweenie atmosphere at the beginning, but doesn't really pay off. Watch at your own risk. The ABCs of Death 2 ("N is for Nexus" segment) (2014) - Great costumes, nice NYC Halloween atmosphere. Recommended (as is the whole anthology). All Hallow's Eve (2007) - Haven't seen this one yet. All Hallow’s Eve (2013) - An anthology film whose wrap-around story is set on Halloween. It wasn't as bad as I expected and has a creepy clown; recommended. All Hallow’s Eve 2 (2015) - Not nearly as good as the original; skip it. The Barn (2016) - A fun, well-done film that is set and filmed like it's the '80s - highly recommended if you can find it (it's doing the festival rounds now)! Boo (2005) - Set on Halloween night at an abandoned, haunted asylum, this one is surprisingly ok for a low-budget film. Recommended! Clownhouse (1989) [watch on YouTube] - Set two weeks before Halloween, so it's not too Halloweenie, but crazed killer clowns are entertaining nonetheless. Recommended. The Clown Murders (1976) - Haven't seen it. The Crow (1994) - Set on Devil's Night or the night before Halloween, recommended! Dark Night of the Scarecrow (1981) - This made-for-TV horror movie is bigotry and revenge in a small town, set around autumn and Halloween. Recommended! Donnie Darko (2001) - Time-travel film with a twist set around Halloween in the '80s, complete with Halloween party, costumes, and a great soundtrack. Recommended! Fear, Inc. (2016) - A horror junkie and his friends sign up with a company that brings their customer's greatest fears to life. 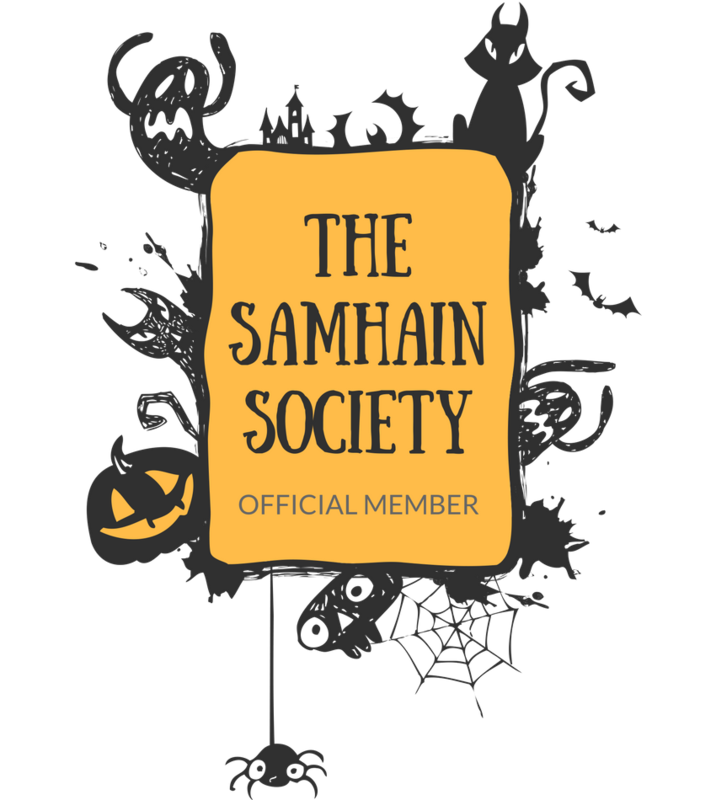 The personalized haunt experience comes to the group on Halloween night. This was okay, but didn't have much Halloween atmosphere going for it. Watch at your own risk. Flesheater (1988) - Haven't seen it, but it's a low budget zombie movie set on Halloween night. The Fun Size Horror Vol. 1 (2015) - Anthology that has a nicely animated Halloween intro, but the stories themselves are not very Halloween-related. Watch at you own risk. The Funhouse Massacre (2015) - Set at a haunt on Halloween where a group of escaped mental patients masquerade as scare actors and start killing off guests. A little light on story, but somewhat entertaining, watch at your own risk. Ghostwatch (1992) - A faux documentary investigating a haunted house and set on Halloween, it convinced millions of British viewers that it was real. Recommended. Ginger Snaps (2000) - Love this film, and the Canadian autumn imagery and Halloween costume party makes it a fabulous werewolf film to watch around Halloween. Recommended. The Guest (2014) - Fantastic film about a drifter crashing at a family's home who may not be who he says he is. 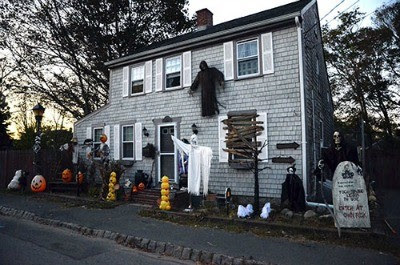 Lots of Halloween decor in this one. Recommended! Hack-o-Lantern (aka Halloween Night) (1988) - Satanists on Halloween! Yes, it's supremely cheesy, but recommended! Hallow’s End (2003) - This low budget is set at a Halloween haunt and was better than I expected, recommended! Halloween (1978) - Do I even need to say anything? Probably THE Halloween movie! Highly recommended! Halloween II (1981) - Picking up right where the first one left off. Recommended! Halloween III: Season of the Witch (1982) - This one leaves out Michael Myers altogether for a more Samhain-centric storyline. Recommended! Halloween 4: The Return of Michael Myers (1988) - Michael Myers is back, and though not quite as strong as the first two films, still recommended. Halloween 5: The Revenge of Michael Myers (1989) - Watch at your own risk. Halloween: The Curse of Michael Myers (1995) - Watch at your own risk. Halloween: H20 (1998) - Recommended. Halloween: Resurrection (2002) - Skip it. Halloween (2007) - Full of Halloween atmosphere, but really depends on whether you care for Rob Zombie's films, watch at your own risk. Halloween II (2010) - Sequel from Rob Zombie, and also has lots of Halloween style, but watch at your own risk based on whether you like Rob Zombie's style. Halloween Night (2006) - Skip it. Halloweenight (2009) - Haven't seen it. Hell House LLC (2016) - This found footage film is set in a Halloween haunted house as a crew prepares for October. I really dug it and thought it was pretty spooky! Recommended. Hell Night (1981) - This is kind of a cheat since I don't think it is set around Halloween, but the characters wear costumes so I am including it. Recommended. Hellbent (2005) - Slasher set on Halloween in West Hollywood, recommended! Hellions (2015) - Trippy visuals and nightmarish atmosphere featuring otherworldly trick or treaters on Halloween, recommended! Holidays ("Halloween" segment) (2016) - the Halloween segment itself is awful, recommended for the rest of the shorts which are themed around other holidays, otherwise skip it. Hollowgate (1988) - Awful low-budget slasher set on Halloween. Skip it. The Hollow (2005) - Set at a hayride on Halloween with a headless horseman running amuck. Yes, it's cheesy, but I had fun with it! Recommended. The Hollow (2015) - Different from the movie mentioned above, this one deals with three sisters being stranded on an isolated island facing off against a monster on the night before Halloween. It's pretty forgettable, though I dimly seem to recall a tiny bit of fall foliage in this one. Not really enough to make up for its dull storyline, though. Watch at your own risk. Home Movie (2008) - Only briefly set on Halloween, but the film itself is chilling and recommended. Honeyspider (2015) - Fantastic Halloween atmosphere and music, but lacking good acting or a fully realized storyline. Watch at your own risk. House II (1987) - A zany sequel that's set around Halloween, complete with brief scenes of a costume party. Recommended if you like weird movies. House of 1000 Corpses (2003) - A group seeks refuge with a backwoods family after their car breaks down Halloween night, though unbeknownst to them the family has murderous intentions. 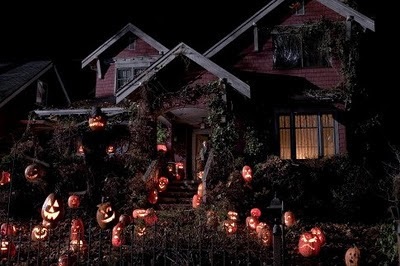 This has some cool Halloween imagery and decor, and is directed by Rob Zombie. Recommended. The Houses October Built (2014) - Halloween enthusiasts travel the country looking for the most extreme haunted attraction, but the one they find may scare them to death. I didn't care for this one, but the haunt scenes were cool; watch at your own risk. The Houses October Built 2 (2017) - Haven't seen it. I Am Not a Serial Killer (2016) - I loved this movie (check out some of my thoughts here), and it opens on Halloween and features a scene of a high school Halloween dance. Recommended. It’s My Party and I’ll Die If I Want To (2009) - This indie film about a Halloween party delivers! Recommended. Jack-O (1995) - On Halloween night, the vengeful monster Jack-O is released from his grave to continue its bloodthirsty quest begun nearly one hundred years before. Cheesy, but in a so-bad-it's-good way; watch at your own risk. May (2000) - Shy May just wants a friend, but when those around her continually disappoint her, she decides to make her own. Recommended, though only the last part of the film is set on Halloween night. The Midnight Hour (1985) [watch on YouTube] - Highly recommended for goofy '80s fun as the whole film is set at a Halloween party! Plus the soundtrack is pure Halloween goodness! Mischief Night (2013) - A blind woman must protect herself against a mysterious intruder the night before Halloween. Better than I expected, but it has no Halloween atmosphere/decor at all. Watch at your own risk. Mischief Night (2014) - Haven't seen it. Mr. Halloween (2007) - Skip it. Murder Party (2007) - A lonely man shows up at a Halloween party with killer consequences. I didn't care for this one, but a lot of people liked it; watch at your own risk. Night of the Demons (1988) - At a Halloween party in an abandoned funeral home guests start getting possessed. An '80s classic; recommended! Night of the Demons 2 (1994) - Not as good as the first, but also recommended. The Pumpkin Karver (2006) - Skip it (though I do love the pumpkin patch scenes). Pumpkinhead (1988) - Witches, pumpkin patches, and demonic pumpkin-headed monsters? 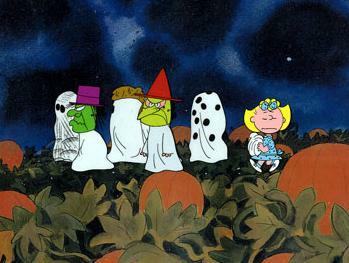 They are all here, and though Halloween isn't really overtly mentioned, this is very Halloween-y feeling. Recommended. Satan’s Little Helper (2004) - A bratty boy befriends a man in a devil costume on Halloween, not realizing that the Halloween pranks he is involved in are all too real. 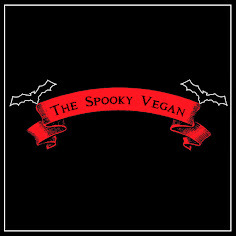 This dark comedy is one of my Halloween faves! Recommended. Scare Zone (2009) - Workers at a Halloween haunted attraction are killed off one by one. It has a good haunt atmosphere, but the story is meh; watch at your own risk. Sleepy Hollow (1999) - The legend of the headless horseman and Ichabod Crane who sets out to solve the mystery. This Tim Burton tale has a New England Halloween feel, full of jack-o-lanterns and a gloomy, fog-drenched woods. Recommended. Slugs (1988) - This campy creature feature is set around Halloween and the climax occurs on Halloween night. Halloween atmosphere is scarce, but there is a high school Halloween party that has some jack-o-lanterns and a few costumed teens. Watch at your own risk. Something Wicked This Way Comes (1983) - This film is big on nostolgic small town Halloween celebrations and autumn imagery, plus a classic tale from the King of the October People himself, Ray Bradbury. Recommended! Tales of Halloween (2015) - A fun, goofy, anthology filled with Halloween-themed short films, recommended! Trick or Treats (1982) - An escaped madman comes home Halloween night when his son is playing pranks on the babysitter. 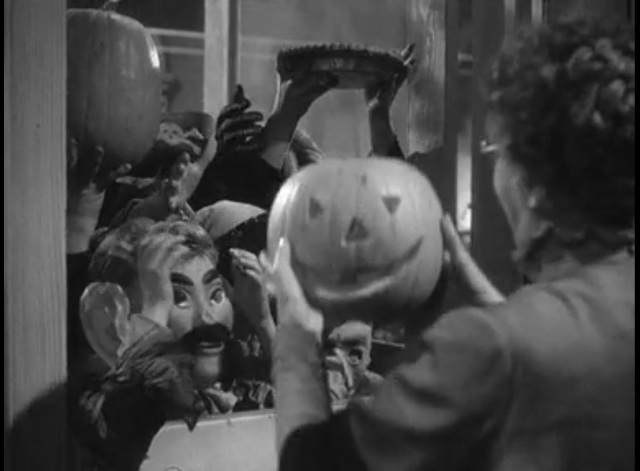 Some fun Halloween gags, but the rest of the film drags. Watch at your own risk. Trick or Treat (1986) - A loner metalhead accidentally brings his favorite rock 'n' roll idol back-from-the dead after playing his unreleased material backwards. You can't go wrong with metal and Halloween, plus this one has some neat cameos. Highly recommended! Trick 'r Treat (2009) - This wonderfully done Halloween horror anthology is a new classic and sets the bar high for Halloween stories and imagery. A must-watch every Halloween, and it goes without saying that it is highly recommended. Terrifier (2018) - Art the Clown from All Hallows Eve returns to terrorize two women (and anyone else who gets in his way) on Halloween night. This one doesn't have much in the way of Halloween ambiance, but it is a wickedly gory and mean-spirited film that I very much enjoyed. Recommended. V/H/S (segment “10/31/98”) (2012) - A group heads to a Halloween party, but unknowingly get the wrong house and stumble upon something terrifying. Recommended. WNUF Halloween Special (2013) - This is another faux news documentary that features a live newscaster and crew investigating a supposedly haunted house on Halloween. It has a great retro feel complete with '80s-style commercials and a grainy, filmed-on-VHS look. Recommended! Addams Family Values (1993) - The whole film is kooky, but it isn't really Halloween-y, and more of a summer flick. However, the Thanksgiving play gives it an autumn-like feel so I couldn't resist putting it on this list. Recommended. Arsenic and Old Lace (1944) - This quirky classic features some wonderful autumn and Halloween scenes. Recommended. Boo! A Madea Halloween (2016) - Set on Halloween night, it has some funny moments. Boys in the Trees (2016) - An achingly beautiful look at lost friendship set on Halloween night in 1997 in Australia. Ed Wood (1994) - It has a snippet of kids trick or treating at Bela Lugosi's (played by Martin Landau) house on Halloween. Flatliners (1990) - This thriller about a group of doctors trying to explore what lies beyond death features a few scenes set on Halloween, including one of a bonfire party with lots of people in costume. Fun Size (2012) - This teen comedy is set on Halloween night and follows the adventures of a girl who is trying to find her little brother after he gets lost trick or treating. Recommended. Gravy (2015) - This off the rails black comedy features tons of gory slapstick when a trio of costumed misfits invades a restaurant and forces the employees to engage in depraved gluttony. Recommended. Grow Up, Tony Phillips (2013) - I haven't seen this. Idle Hands (1999) - This teen horror/comedy about the protagonist's hand getting an evil mind of it's own is set around Halloween and mostly at a party on Halloween night. Recommended. The Karate Kid (1984) - It features a scene where Daniel (Ralph Macchio) is being chased through the night by a group of Cobra Kai bullies wearing skeleton costumes. Mad Monster Party (1967) - This stop-motion classic about a bunch of monsters coming together at Dr. Frankenstein's castle isn't exactly set on Halloween, but to me it will always be something I love to watch this time of year! Recommended. Meet Me in St. Louis (1944) - This film features a segment on Halloween and shows how it was celebrated in 1903 - with kids terrorizing the neighborhood (with the parents and neighbors playing along in good fun). This is how Halloween was once celebrated, as more of a "mischief night" than anything else! Once Bitten (1985) - A young Jim Carrey stars in this comedy about a teen being bitten by a vampire and slowly transforming into one. A rad '80s high school Halloween dance is one of the most fun scenes in the movie. Recommended. Roseanne: Tricks and Treats (Halloween episodes from various seasons) - One of my favorite things to watch around Halloween! They really knew how to Halloween! Recommended. The Simpsons - Treehouse of Horror (various seasons) - More most-see Halloween TV for me! Recommended. Spaced Invaders (1990) - I haven't seen this one, but it is set on Halloween and features aliens. To Kill a Mockingbird (1962) - In both the film and book, Halloween plays a pivotal role in the story of this drama where a man is wrongfully accused based on race. We Need to Talk About Kevin (2011) - This bleak drama features an unsettling scene on Halloween night as Eva (Tilda Swinton) drives through a neighborhood while trick or treaters seem to menace and upset her. Recommended. Haunters: The Art of the Scare (2017) - recommended; read my thoughts on it HERE! I'm sure I've missed some Halloween-themed movies, so please feel free to leave any films I should add in the comments below! Wow, thanks for the suggestion some of them I've never considered. But this is increably extensive, I'll be watching some of thesse over the next few weeks. Doesn't the film "Terror Train", w/Jamie Lee Curtis, take place during Halloween? I remember everyone wore costumes,while a killer was on the loose. Great list! This list is so awesome! Thank you so much! Guess I have to watch everything! Castle of Blood takes place on All Soul's Night which is the night of November 1.